It feels as if I blinked and suddenly the Holiday’s were here! That means one thing: gift guides. Throughout the coming weeks, in additional to routine outfit and beauty post’s, I will be sharing a series of “SS Gift Guides” for everyone on your holiday shopping list. 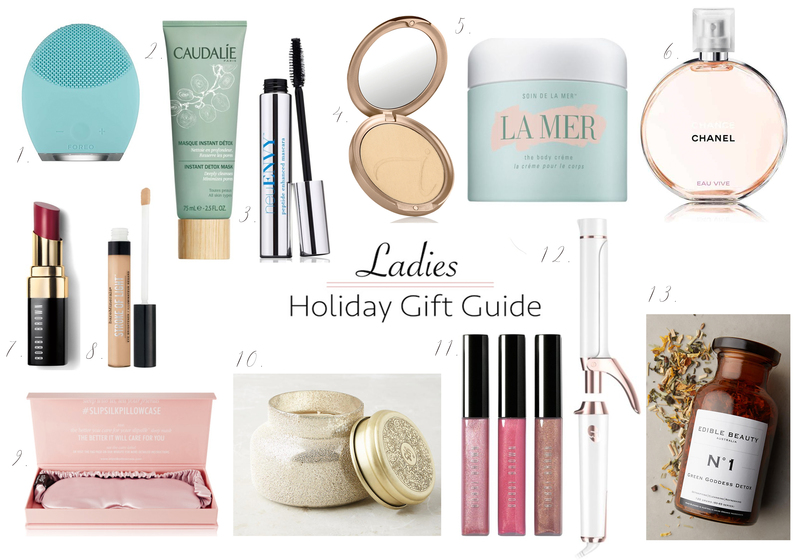 Today I’ve decided to kick things off with a selection of beauty related gifts that are perfect for your bestie, mom, sister, or any special friend or lady in your life. You can shop this post by clicking on the linked text or the scrolling images below. FOREO Facial Cleaning Device, $99: The key player in my skin care routine! CAUDALÍE Masque, $39: Hydrating and purifying, give the gift of beautiful skin this holiday season. neu ENVY Mascara, $32: I’ve been using neuLASH eyelash enhancing serum for about a year now, and love it! I’m happy that there is now an FDA approved growth enhancing mascara available for purchase. I use this in combination with L’Oreal’s Voluminous Mascara. Jane Iredale Compact, $30: Purchased Jane Iredale’s mineral press powder in the Highlands after leaving my makeup bag at home last month. It’s become my best kept beauty secret. I managed to convince a few fellow bloggers to give it a try and they too love it! La Mer Body Cream, $275: Yes this is expensive, but it’s a huge container that will last a long time. I’ve never a found a body cream that moisturizes without leaving behind a oily residue. My hands and skin get really dry in colder months, and one application a few times a week keeps my skin hydrated and fresh! Chanel Perfume, $78-$125: I rarely leave the house without a sprits of Chanel perfume! Create your on scent by layering a few different aromas! Bobbi Brown Lipstick, $28: This limited edition lipstick is the perfect shade this holiday season. Bare Minerals ‘Stroke of Light’ Concealer, $23: Thumbs up! ‘Slipsilk’ Eye Mask, $45: Cotton is proven to be more absorbent than silk, meaning your night creams will soak into your skin and not into your pillow. Capri Blue Candle, $30: Who doesn’t love a beautiful smelling candle? Bobbi Brown Gloss Set, $49: Pigmented glosses FTW! T3 Curling Iron, $185: I’ve NEVER had curls that lasted this long. Purchase this, especially if you have thick, heavy hair. Beauty Tea, $26: Because other teas are average at best.